Postmodernity is the world view that comes after modernity. Its an evolution on the modern world view and is a vital step in the growth of human ideas. Postmodernists are deconstructionists and pulling apart the aesthetic and purpose of fashion is most definitely a good thing. To a point. Like all deconstruction if you keep going and do not stop, we are left with nothing. 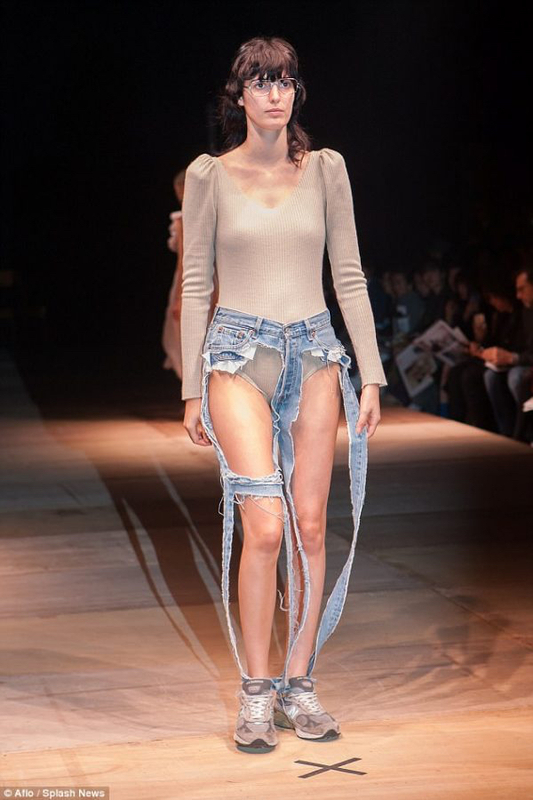 Fashion deconstructed is there for all to see in the latest trend to hit the fashion pages, the jeans with only seams. Japanese designer Thibaut has taken deconstruction to another level with the cut away denim jeans. The practical purpose of fashion has been stripped away leaving the bare minimum needed to still make it a garment. Will anyone wear these? Absolutely yes but there appeal will definitely be limited to the interested in the very cutting edge of fashion. Us mere mortals will continue with the slightly less deconstructed ripped jeans, a trend that was also postmodern in its approach. By rescuing a pair of jeans with holes in from the bin and elevating them to fashion trend the ripped jeans poked a tongue out at the modern fashion of smart. ‘Hippy’ culture, a fashion revolution bringing colour to our wardrobes. The collective rebellion against modern happened most distinctly in the 1960’s with the birth of the hippy or flower power movement. Fashion, and indeed much of culture had, up till then been stuck in a functional dip, along came the summer of love and changed everything. Now what we wore said something about who we are as people. Different values and an objectionable war in Vietnam coalesced into a movement which changed the world. Another facet of postmodern fashion is the man skirt. Its 35 years since Jean Paul Gaultier put men in skirts and it still hasn’t caught on. Skirts are traditionally women clothes and wearing one is not an easy thing for a man to do unless he conforms to the norms and tries his best to look like a woman. As gender norms are increasingly challenged expect to see more men breaking out of there trousers and into a skirt.